Arthur Dent and Marvin both feeling slightly depressed. Arthur Philip Dent, Ph. D. (1963-future), is a astrophysicist, tea fanatic and a vocal speaker in opposition to Thursdays. He currently resides in the starship Heart of Gold, and does now, and always will know where his towel is and he even sometimes lets other people borrow it. For a while, Arthur Dent mildly amused some people by travelling in space-time aboard a Ford Prefect and occasionally saving the world. The "Doctor" was disillusioned by the idea of saving the world when he found out on the radio that The World was a co-production of the BBC World Service, Public Radio International and WGBH Boston. . However, it was in the 1980s that Arthur Dent had his big break in astrophysics after discovering that one of his closest friends was a Betelgeuse native. After hitch-hiking around the galaxy, he returned to Earth to write a series of radio episodes that explained life, the universe and everything through his story of hitch-hiking the galaxy. He used the pseudonym Douglas Noel Adams, which he had previously used around 1952, so as to make it abbreviate to DNA. He became rather famous for this and so wrote up a TV series, a trilogy of five books, a computer game (with his expertise in computing from all those astrophysics simulations), and a screenplay, as well as other miscellanea. Later he became President of his car but voted himself out of office in favor of the Vice President, which was also him. In dishonor of this incident, most modern British politics are termed to be "Arthurian." In public appearances, of course, he wished to remain in hiding, so he asked one of his more witty secretaries to go to those public appearances. Around 2001, he began to doubt the existence of salmons, and was planning to release a book titled The Salmon of Doubt but went into hiding instead, becoming a Puritan writer. He currently receives a nominal fee every year from David Mitchell after a verbal contract was agreed that David would impersonate him in every television appearance. This is similar to Mika's agreement with the family of Freddie Mercury. Tea is something that Arthur Dent can't live without. 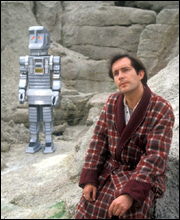 While some species (such as most other humans) form addictions to other liquids like alcohol, tea has the same effect on Arthur Dent. Some sources believe that tea has the same effect on improbability physicists which has lead to the rather high glitch factor in improbability drives. One Common problem on Inprobability-Drived Ships (and their liquid-makers) is that it cannot make tea (which probably hints at drunk inventors). Arthur Dent never really could get the hang of Thursdays. Arthur Philip Dent, Ph. D. as he wakes up to another incomprehensible Thursday. Oh, he actually has an asteroid after him. "18610 Arthurdent". No honest he does! This page was last edited on 7 March 2012, at 00:21.